After being awestruck by the azure shades of Pangong Tso we were back in Leh and were ready to have our breath taken away in a very different manner in a different setting. For the final day we set out seeking thrill on the waters. 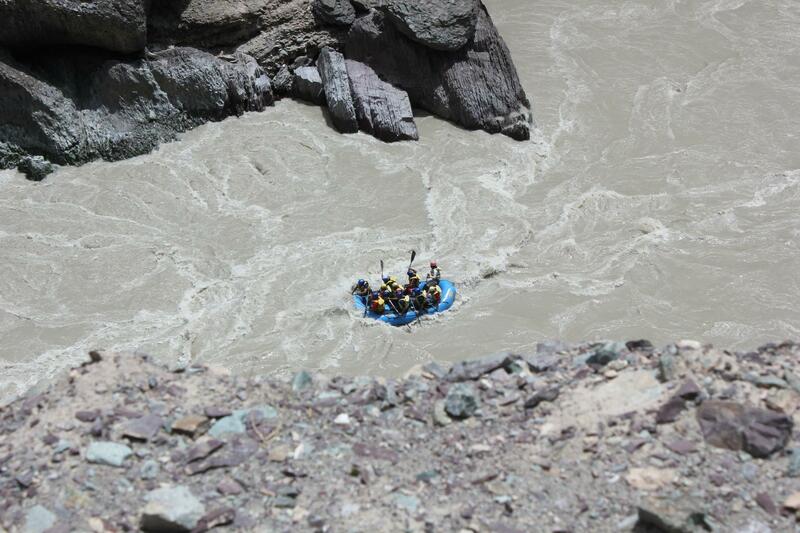 A drive of over a little longer than an hour (scenic as usual) got us to the starting point of our rafting adventure on Zanskar. 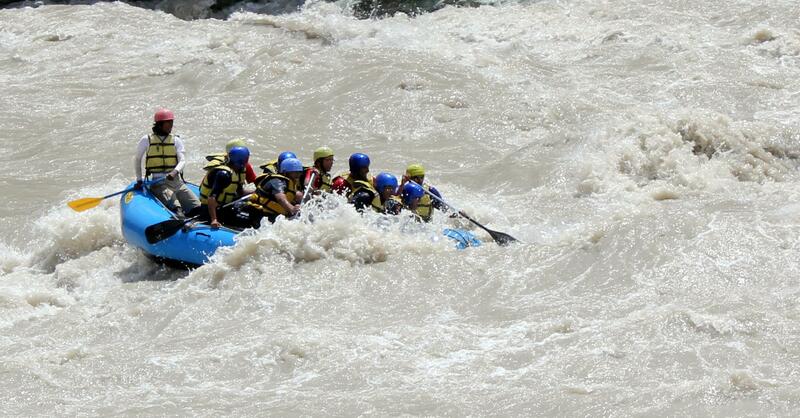 In no time we were kitted up and piled on to 3 rafts along with some other fellow tourists. 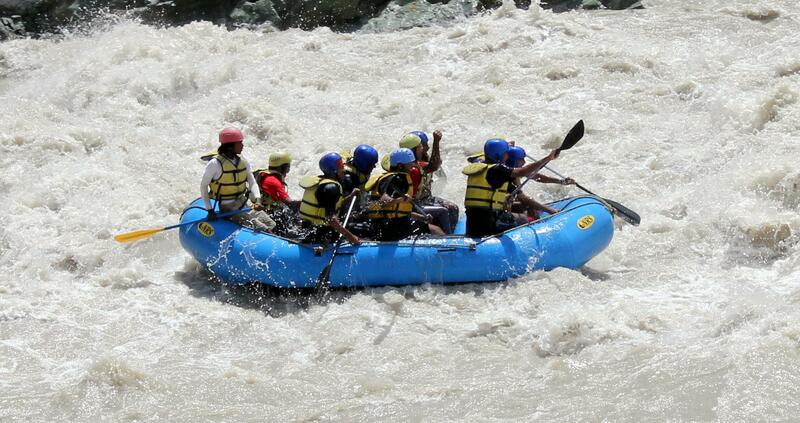 The waters couldnt be any more different from the previous rafting experience in the pristine green eaters of Rishikesh. Rain in the source of Zanskar had ensured that the water levels were higher and the water was very muddy and dirty brown! All ready to board! Ahoy and away!! 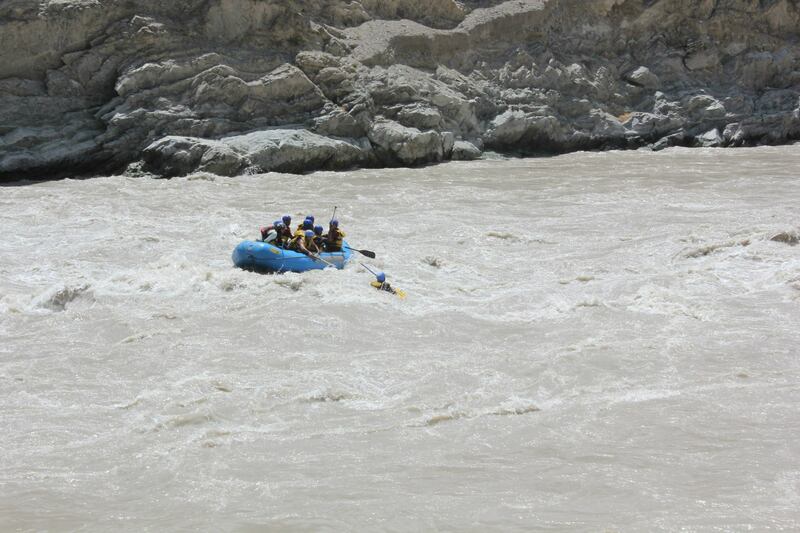 After a short while of smooth flowing we were upon our first rapid and in for a taste of the bumpy ride ahead. 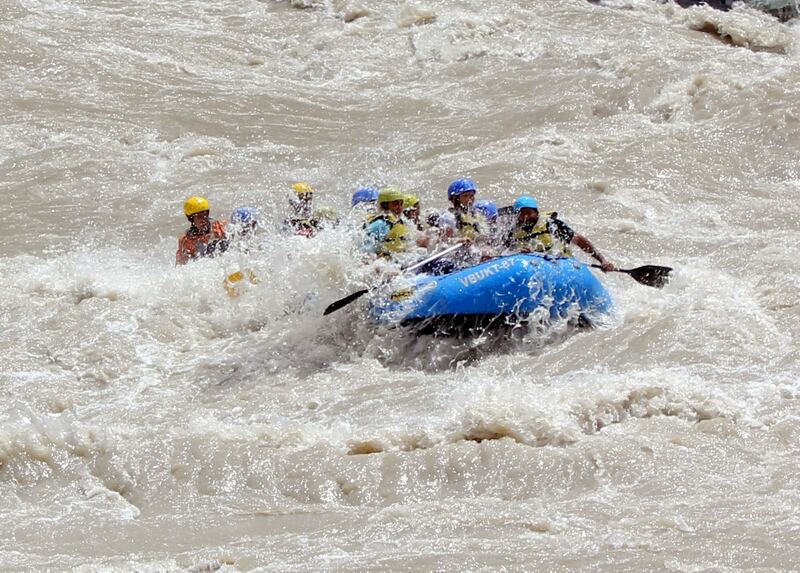 The higher water levels meant that rapids were less rocky and easier to navigate with lesser turbulence. Even with the less cumbersome water levels the course made for a very interesting ride and a good adventure experience. 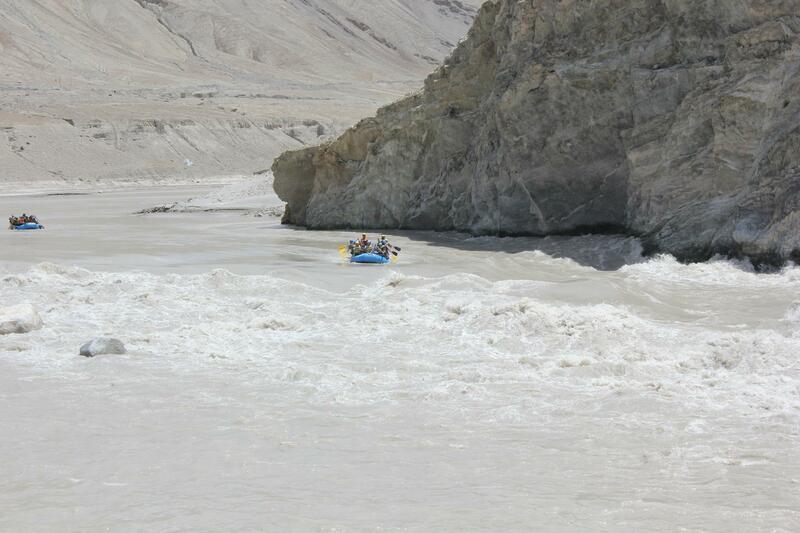 There were a few smooth stretches for those of us who fancied a dip in the Zanskar. 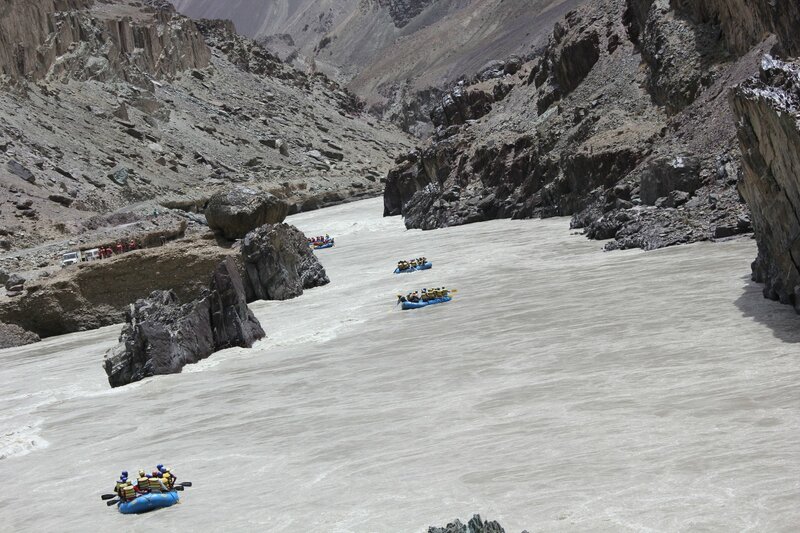 Towards the end of the course we encountered the point were Zanskar joins Indus river. Navigating the twists n turns! There were many a rafters around. Our 3 rafts and a few others in the backdrop! However it wasnt to be a smooth ride after all. 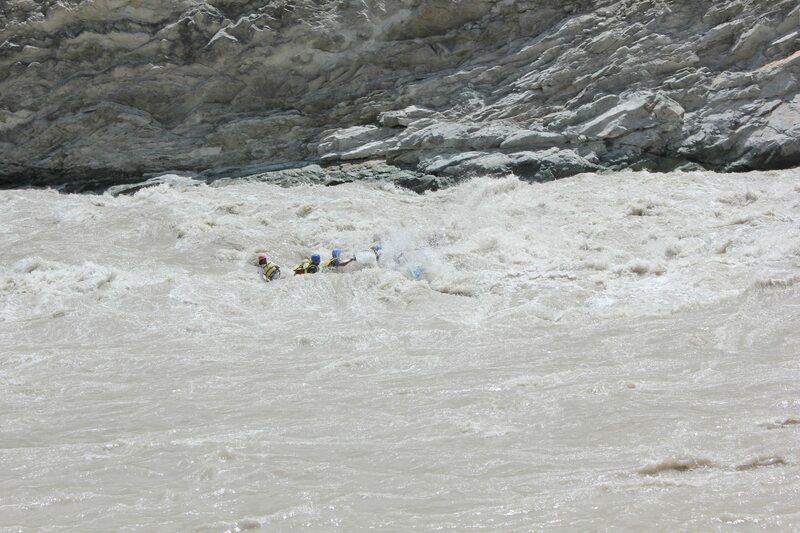 Our guides based on their assessment of our capabilities and also the smoother flow due to higher water levels decided to take us on one last rapid that was Grade 5. 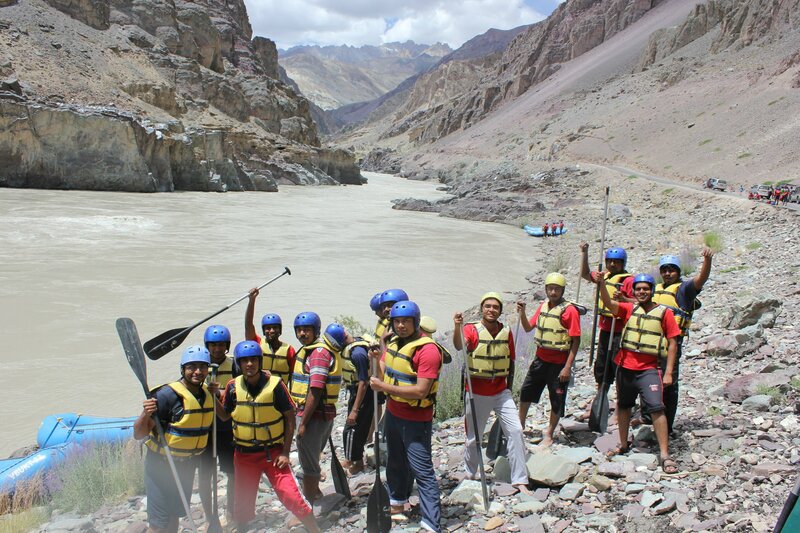 For the uninitiated rapids are graded 1 – 7 and generally grade 1-4 is only for amateurs and the higher ones are left for professionals. Grade 7 i presume would be rafting on a waterfall! 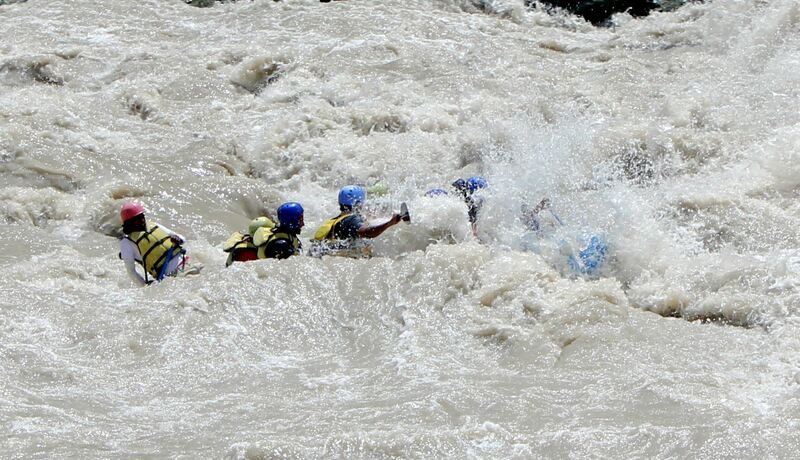 Anyhow now the guides thought we were up for the grade 5 rapid and who were to disagree. And so there was to be a first time for me afterall in this trip! Now this was no smooth ride and the experience can be best captured in a series of photographs better than any words can. 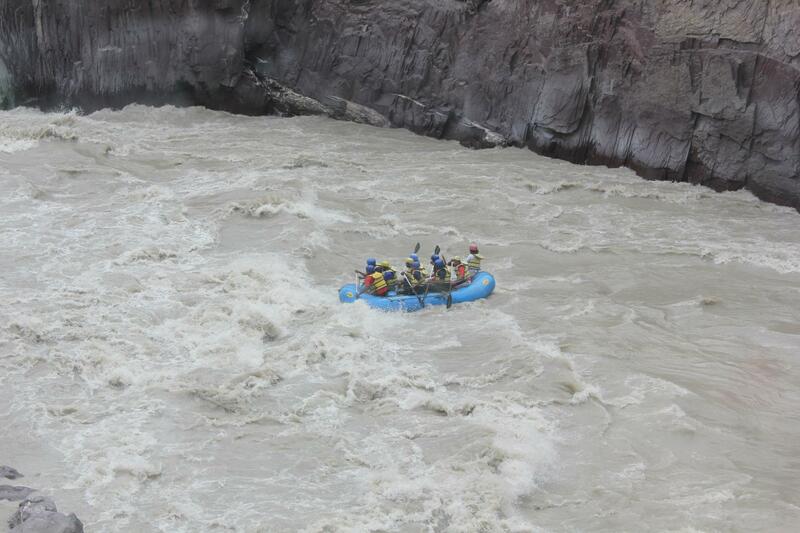 After the momentous passage of the other raft when a fellow German tourist needed to be pulled out of water, ours approached the challenge ahead! 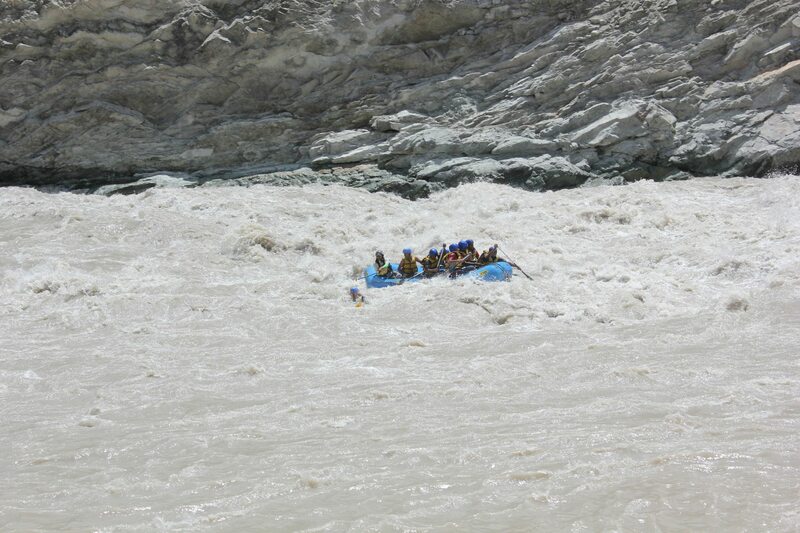 the lead raft approaching the grade 5 rapid! When on of the fellow tourists gets thrown of the raft. Rescue efforts thankfully quite swift and successful. Where is the raft!! Where are we?! Taking a closer look. Still barely a sign of the raft and its passengers! Finally emerging from the water victorious!! 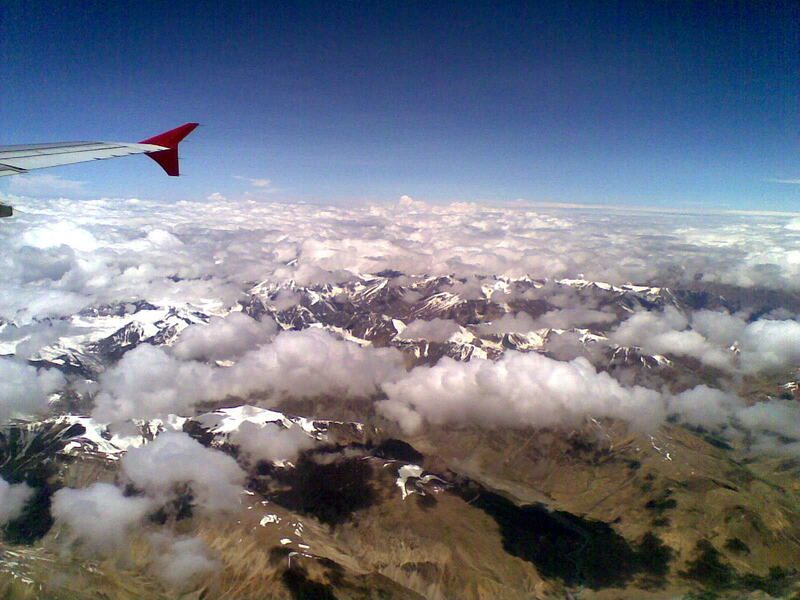 And that harrowing and exhilarating experience was a fitting finale to our Ladakh adventure and soon we were flying over the Himalayas from Leh airport! Adios Ladakh! It was an experience like no other. Hasta la vista!